I’m pulling up roots, so to speak. But only the figurative kind, thank goodness–my sweet container farm can go anywhere with relatively little hassle. Relatively. ‘Cause despite the fact that I didn’t have to do any digging, you don’t want to know how much finagling and fussing it took to fit 6 foot high tomato plants into a modest Jeep. You just don’t want to know. Forgive the poor quality of that one…I was too excited to make salad to dig for my digital camera, so I just held my laptop up to the bowl. And that is so not my hand in the picture. But spookily enough, I don’t remember whose hand it is. Maybe there was no hand. Maybe it just kind of…appeared…in the photograph. 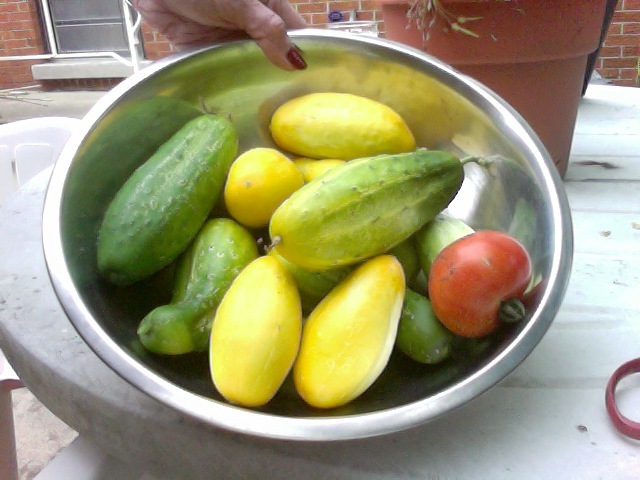 So thanks, prosthetic ghost hand that appeared out of nowhere to help me take pictures of my garden vegetables. Thanks a whole hell of a lot. In addition to the assistance you lent me, it’s so nice to know that the afterlife isn’t so taxing that you can’t take a little time out of your busy schedule of making walls bleed and watching people go to the bathroom to help the living out. And it’s cool that you still manicure your nails. To impress the other ghost hand thingies. Man, I really hope I’m that cool in the afterlife. But I digress. I wildly, ridiculously digress. 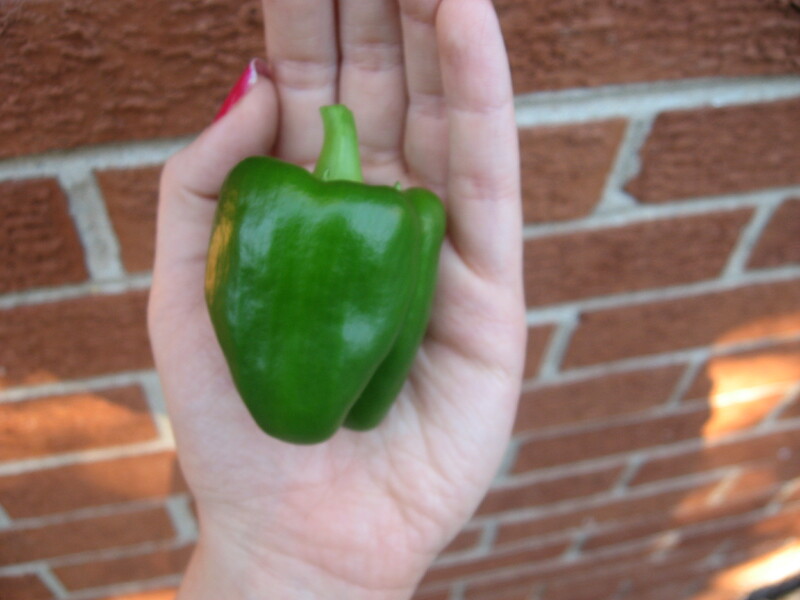 Aw, well hey there, little pepper! What caused you to mosey all the way on over here? What’s that? Your gardener showed you off too many times and weakened your stem, causing you to break off in her hand, you say? She’s responsible for all this carnage, you mean? She’s the sole reason you’re never going to be an enormous stuffed pepper, thereby realizing all your inborn potential? That’s not my hand in this picture either. The nail polish is all chipped and stuff. I would never let my nail polish get all chipped and stuff. Oh, okay, fine, so it IS my hand. And yes, I’m perfectly aware that this means prosthetic ghost hand thingies have better manicured nails than I do. Whatever. Maybe when I’m a ghost hand thingie I’ll take the time for more regular manicures. Until then…CHIPS GALORE, MISFITS! Ah, lemon cucumbers. You took a bit longer to show up than the others, but oh. Oh. Were you ever worth the wait! You are the most cucumbery cucumber I’ve ever tasted, and I have tasted some cucumbery cucumbers in my day. Also, I don’t think I’ve said cucumbery enough. Cucumbery. Cucumbery Cucumbery. Cucumbery Cucumbery Cucumbery. Alright, now that’s just excessive. Friends? My resolution for next year is going to be to learn the difference between not saying cucumbery enough, and saying it too much. I hope you’ll help me along on the rough journey I have ahead of me. And that sweet little, beautiful eggplant? It’s a fairytale variety, no bigger than the palm of your hand, and so far, my plants have been problem-free. 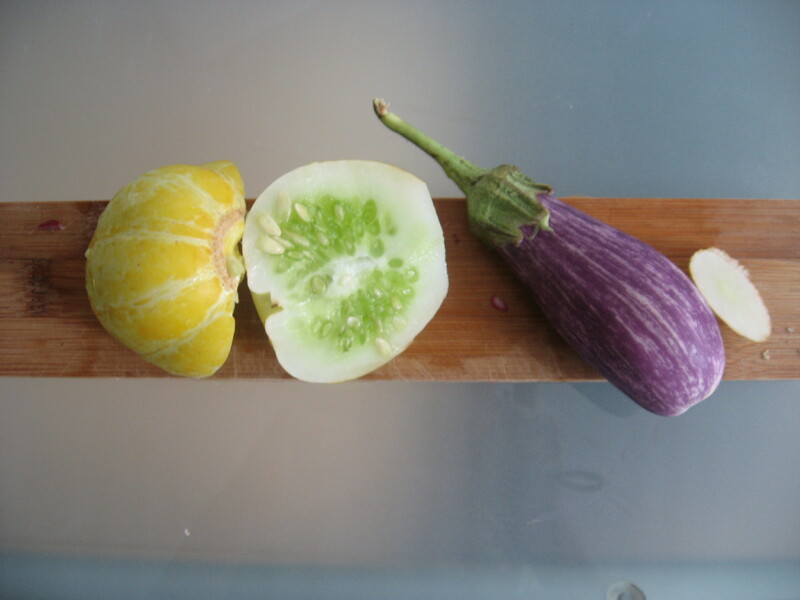 In my gardening research I read post after post about how awfully hard it is to grow eggplants. How pest-ridden and finicky and disease-prone they are. But misfits? They have been the easiest, most pest-free things I’ve grown this year. No holes. No bugs. No disease. EXTREMELY productive. And just gorgeous. If you told me they were just ornamental plants, I’d believe you. You’ll see. YOU’LL ALL SEE! Okay, now I’m at a boil, and I’m gonna take things down to a simmer. My parole officer–I TOTALLY MEAN FRIENDS AND FAMILY–says that’s good for me. And that’s all you’re getting out of me today, fair readers. But stay patient. Remain true. And I promise that when next we meet, I’ll have a recipe for you. Life will be more normal. Or at least, my version of normal. Which is probably your version of sick and twisted and as crazy as a clown with ADHD. But that’s why you like me, right? What’s that? You’re really here because I make you feel better about your own life? Sorry, I can’t really hear you, THE STATIC ON OUR CONNECTION IS TERRIBLE I’LL HAVE TO TALK TO YOU LATER GOODBYE!